Circle of Hearts Silvertone Necklace with Crystals Just $6.00 Down From $24.99 At GearXS! Ships FREE! You are here: Home / Great Deals / Circle of Hearts Silvertone Necklace with Crystals Just $6.00 Down From $24.99 At GearXS! Ships FREE! 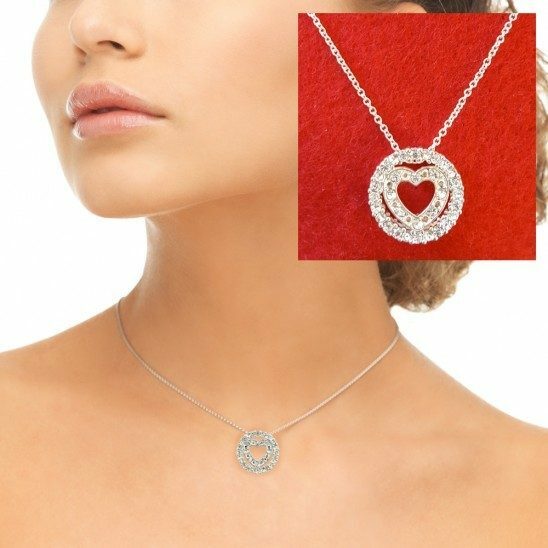 GearXS has this beautiful Circle of Hearts Silvertone Necklace with Crystals on sale for $6.00 (Reg. $24.99) when you use promo code GSX-6 + FREE shipping! This lovely heart-cutout pendant sits on a 16″ chain with a 3″ extender. Features amazing silvertone crystals and comes in a very pretty pink pouch. with a big red heart. Perfect gift for that special someone this Valentine’s Day!